PS: This post is the continuation of the post INTRODUCTION TO PIC. A microcontroller is a single chip microcomputer made through VLSI fabrication. A microcontroller also called an embedded controller because the microcontroller and its support circuits are often built into, or embedded in, the devices they control. A microcontroller is available in different word lengths like microprocessors (4bit,8bit,16bit,32bit,64bit and 128-bit microcontrollers are available today). 2) A microcontroller internally consists of all features required for a computing system and functions as a computer without adding any external digital parts in it. 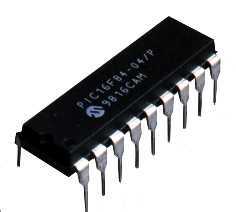 3) Most of the pins in the microcontroller chip can be made programmable by the user. 4) A microcontroller has many bit handling instructions that can be easily understood by the programmer. 5) A microcontroller is capable of handling Boolean functions. 6) Higher speed and performance. 7) On-chip ROM structure in a microcontroller provides better firmware security. 8 ) Easy to design with low cost and small size. The basic structure and block diagram of a microcontroller is shown in the fig (1.1). CPU is the brain of a microcontroller. CPU is responsible for fetching the instruction, decodes it, then finally executed. CPU connects every part of a microcontroller into a single system. The primary function of CPU is fetching and decoding instructions. The instruction fetched from program memory must be decoded by the CPU. The function of memory in a microcontroller is the same as a microprocessor. It is used to store data and program. A microcontroller usually has a certain amount of RAM and ROM (EEPROM, EPROM, etc) or flash memories for storing program source codes. Parallel input/output ports are mainly used to drive/interface various devices such as LCDâ€™S, LEDâ€™S, printers, memories, etc to a microcontroller. Serial ports provide various serial interfaces between a microcontroller and other peripherals like parallel ports. This is the one of the useful function of a microcontroller. A microcontroller may have more than one timer and counters. The timers and counters provide all timing and counting functions inside the microcontroller. The major operations of this section are performed clock functions, modulations, pulse generations, frequency measuring, making oscillations, etc. This also can be used for counting external pulses. ADC converters are used for converting the analog signal to digital form. The input signal in this converter should be in analog form (e.g. sensor output) and the output from this unit is in digital form. The digital output can be used for various digital applications (e.g. measurement devices). DAC perform reversal operation of ADC conversion.DAC converts the digital signal into analog format. It usually used for controlling analog devices like DC motors, various drives, etc. The interrupt control used for providing interrupt (delay) for a working program.Â The interrupt may be external (activated by using interrupt pin) or internal (by using interrupt instruction during programming). Some microcontrollers used only for some special applications (e.g. space systems and robotics) these controllers containing additional ports to perform such special operations. This considered as special functioning block. 3 This must have many additional digital components to perform its operation Can function as a microcomputer without any additional components. The main advantages of microcontrollers are given. a)Â Â Â Â Â Microcontrollers act as a microcomputer without any digital parts. b)Â Â Â Â As the higher integration inside microcontroller reduces cost and size of the system. c)Â Â Â Â Â Usage of a microcontroller is simple, easy to troubleshoot and system maintaining. d)Â Â Â Â Most of the pins are programmable by the user for performing different functions. e)Â Â Â Â Â Easily interface additional RAM, ROM,I/O ports. f)Â Â Â Â Â Â Low time required for performing operations. a)Â Â Â Â Â Microcontrollers have got more complex architecture than that of microprocessors. b)Â Â Â Â Only perform a limited number of executions simultaneously. c)Â Â Â Â Â Mostly used in micro-equipments. d)Â Â Â Â Cannot interface high power devices directly. You can find microcontrollers in all kinds of electronic devices these days. Any device that measures, stores, controls, calculates, or displays information must have a microcontroller chip inside. The largest single use for microcontrollers is in the automobile industry (microcontrollers widely used for controlling engines and power controls in automobiles). You can also find microcontrollers inside keyboards, mouse, modems, printers, and other peripherals. In test equipment, microcontrollers make it easy to add features such as the ability to store measurements, to create and store user routines, and to display messages and waveforms. Consumer products that use microcontrollers include digital camcorders, optical players, LCD/LED display units, etc. And these are just a few examples. Some basic applications of a microcontroller are given below. a)Â Â Â Â Â Used in biomedical instruments. b)Â Â Â Â Widely used in communication systems. c)Â Â Â Â Â Used as a peripheral controller in PC. d)Â Â Â Â Used in robotics. e)Â Â Â Â Â Used in automobile fields. Identify one microcontroller in terms of its internal function block technical details that makes you to identify it embedded microcontroller or not a general microcontroller..
Plz help me to find answer for this question. This website states all about microcontrollers. I got what I need. Thanks to circuitstoday.com. I must so excited for this great Chip which is caperbel of performing Multi functions ranging from Toys to Robotics applications. Bravo to the Manufacturers! I hav checked on the different types of the Microcontrollers, but they are dozens from different Companies. Therefore; I would like to know which one is most suitable for Automotive applications and as well the Configuration of the Pins in many different circuits. Thanks, Hope Ill find my answers. Wow, these are all I really looking for… Thank’s to circuitstoday!